Seeming almost alien, the upright, often completely bare, gray stems of ocotillo (Fouquieria splendens) doesn't offer friendship with its fiercely armed growth. Ocotillo has a strange charm all its own. In spring, when each stem is topped by brilliant spikes of bright red, tubular flowers, the ocotillo commands attention. Native to the Southwestern deserts, ocotillo grows in U.S. Department of Agriculture plant hardiness zones 8 through 11. It doesn't need much care if you plant it in the right spot. Ocotillo grows slowly, and the only way to get a plant large enough for a garden is to buy one that has been legally harvested from the wild. Plant a bare-root ocotillo the same season it was dug, and with the same orientation it had in the wild. The south side of the plant is usually marked. Dig a hole in a sunny, well-draining site. Make the hole larger than the roots and pack soil around the roots to hold them firm. Use rocks around the ocotillo's base to keep it upright. Spray the canes with water before and after planting. Water the ocotillo a week after planting. For the first few months, spray the canes daily. In summer, water weekly and in cool weather, every three to four weeks. It may take several years to reroot the ocotillo, and sometimes it doesn't re-establish. Plant rooted ocotillo canes in a sunny spot at the same level they were at in the container. Few rooted cuttings branch from near the base, although they might branch farther up the cane. They won't develop the swollen basal caudex of a seed-grown plant. Give seedlings enough room to eventually grow into their mature size. An ocotillo doesn't need watering. During cool or rainy weather, the plant will grow a set of green leaves along its stems. The leaves fall off once soil moisture decreases, and an ocotillo can grow several new sets a year. Don't fertilize an ocotillo in the ground. Fertilizing can result in too-fast growth, reduced bloom, and leggy growth that doesn't branch. Don't prune the ocotillo. Allow it a large enough space when you plant it so it won't outgrow its location. An ocotillo can grow to 30 feet tall but only around 10 feet wide. It's possible to grow an ocotillo seedling in a container. Plant it in well-draining cactus potting mix, choosing a container with drainage holes. The pot should be a little larger than the root mass. Put it in full sun on a deck or patio for the spring and summer and bring it in to a sunny spot indoors for winter. It will go dormant in winter, so water once every few weeks. In spring and summer, water the plant when the top 2 to 3 inches of soil are dry. Repot during spring when roots come out the drainage holes. Fertilize only lightly as you repot. Add 1 1/2 teaspoons of 15-9-12 controlled-release fertilizer to a 1-gallon container and 2 tablespoons to a 5-gallon container. Don't fertilize again until the next time you repot. 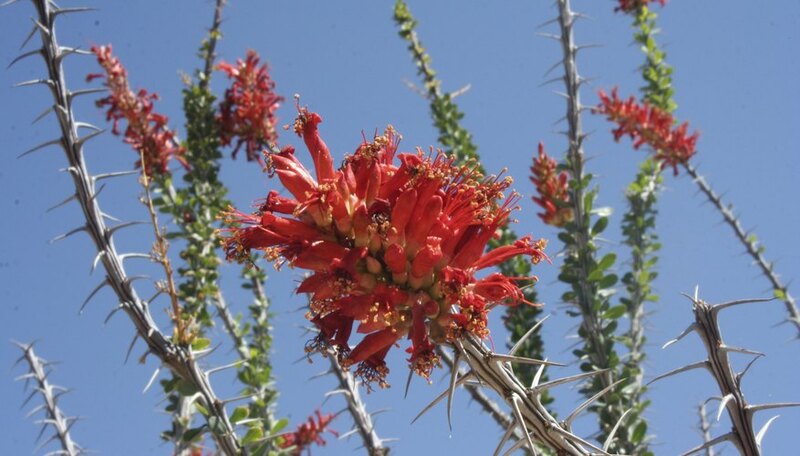 An ocotillo won't have problems with pests or diseases as long as you don't overwater it. Wet soil can encourage root rot. U.S. Forest Service: Fouquieria Splendens Engelm.